This week I stopped at a gas station near Lexington, NC to fill one tank and empty another. On my way to the restroom at the back of the store, I came across a bottle of Nehi Orange! 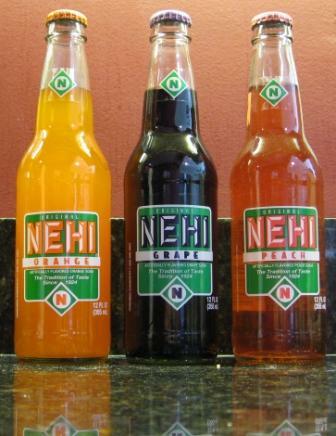 I of course asked the clerk if they had other Nehi flavors, and she went on for several minutes about how great that soda was and that Peach was her favorite flavor. So of course I bought all I could and brought it home for testing. I can now confirm that a Grape Nehi, both straight and with Bacardi, is a phenomenal soda. It is my new favorite. And I love the South. Aside | This entry was posted in Uncategorized and tagged Grape Nehi, Rum. Bookmark the permalink.